Author(s): Ove Andersson, Yasuhiro Nakazawa. Department of Physics, Umea University, 901 87 Umea, Sweden. The thermal properties and transition behavior of the host-guest inclusion compounds: urea, thiourea, Dianin’s compound, clathrate hydrates and hydroquinone have been reviewed. In particular, we summarize their thermal conductivities, heat capacities and transitions at high pressures. Two of the systems: urea inclusion compounds and clathrate hydrates, show unusual glass-like thermal conductivity κ, i.e. their κ is low and only weakly dependent on temperature despite their crystalline structure. Moreover, results for κ of Dianin’s compound with guests such as ethanol and CCl4 indicate a change from glass-like κ at atmospheric pressure to crystalline-like κ at elevated pressure, whereas κ of hydroquinone and thiourea inclusion compounds appears not to have been studied. Despite the technological and fundamental importance of the unusual glass-like κ, e.g. the use of inclusion compounds as structural model systems for finding improved thermoelectrical materials, the origin of the glass-like κ is not established. More specifically, the commonly employed rattling model, in which rattling guest motions cause resonance scattering of the acoustic host phonons, has recently been challenged, and we discuss alternative models. Heat capacity studies of these compounds reveal numerous transitions, which are associated with guest and host disorder-order transitions upon cooling and pressurization. A transition in hydroquinone may be of second order, or have only a small first-order component, which can explain discrepancies in the observed transition behavior. On pressurization at low temperatures, clathrate hydrates collapse to an amorphous state, which appears to be a glassy state of a water solution with perfectly spaced solute molecules. Keywords: Glass-like behavior, glassy water solution, heat capacity, high pressure, inclusion compound, phase transition, phase diagram, pressure induced amorphization, structure, thermal conductivity. Affiliation:Department of Physics, Umea University, 901 87 Umea, Sweden. Keywords:Glass-like behavior, glassy water solution, heat capacity, high pressure, inclusion compound, phase transition, phase diagram, pressure induced amorphization, structure, thermal conductivity. 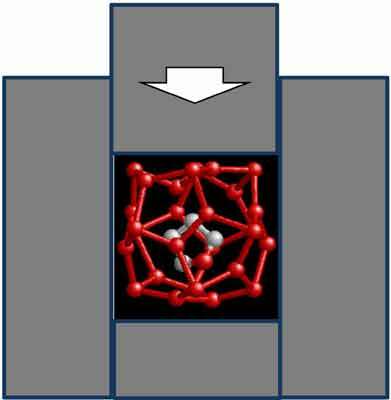 Abstract:The thermal properties and transition behavior of the host-guest inclusion compounds: urea, thiourea, Dianin’s compound, clathrate hydrates and hydroquinone have been reviewed. In particular, we summarize their thermal conductivities, heat capacities and transitions at high pressures. Two of the systems: urea inclusion compounds and clathrate hydrates, show unusual glass-like thermal conductivity κ, i.e. their κ is low and only weakly dependent on temperature despite their crystalline structure. Moreover, results for κ of Dianin’s compound with guests such as ethanol and CCl4 indicate a change from glass-like κ at atmospheric pressure to crystalline-like κ at elevated pressure, whereas κ of hydroquinone and thiourea inclusion compounds appears not to have been studied. Despite the technological and fundamental importance of the unusual glass-like κ, e.g. the use of inclusion compounds as structural model systems for finding improved thermoelectrical materials, the origin of the glass-like κ is not established. More specifically, the commonly employed rattling model, in which rattling guest motions cause resonance scattering of the acoustic host phonons, has recently been challenged, and we discuss alternative models. Heat capacity studies of these compounds reveal numerous transitions, which are associated with guest and host disorder-order transitions upon cooling and pressurization. A transition in hydroquinone may be of second order, or have only a small first-order component, which can explain discrepancies in the observed transition behavior. On pressurization at low temperatures, clathrate hydrates collapse to an amorphous state, which appears to be a glassy state of a water solution with perfectly spaced solute molecules.